The Star Wars releases have been almost on top of each other recently, and I actually got this book just one week after picking up Lords of Nal Hutta. 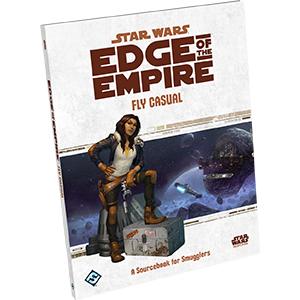 Fly Casual is the sourcebook for smugglers. This is one career I was very eager to see expanded, as it’s one of my favorites other than Bounty Hunter, which I’m sure they are saving for last. 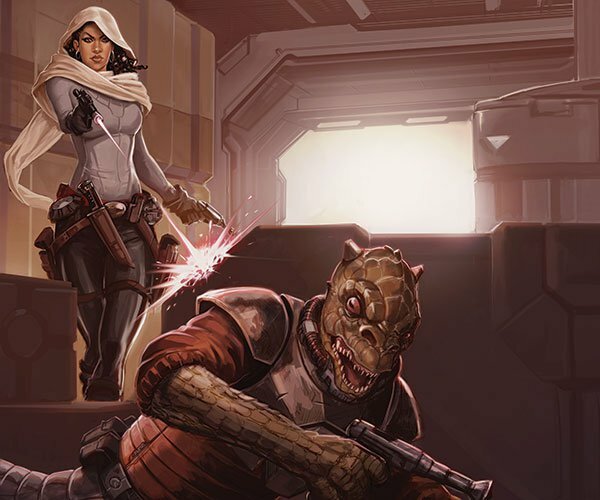 At this point FFG is setting a very high bar for themselves, but this book is going to be hard to top. It’s a familiar format at this point, split up into 3 sections: The first is about new backgrounds, specializations, species and talents. The second goes into new gear and ships (this is pretty much the reason to pick up this book). The third details some excellent GM options like plenty of adventure seeds, mechanics for shoot-outs and showdowns, and Hintaro, a gambling dice game that uses the boost dice. The last part of this section goes into creating a smuggling ring, and the effect of your reputation in different social encounters. The new species introduced are the charming yet reptilian, pheromone-emitting Falleen, the cunningly perceptive Gotal, and the headstrong octopus-faced Quarren. The Quarren are some of the coolest looking aliens in Star Wars in my opinion. 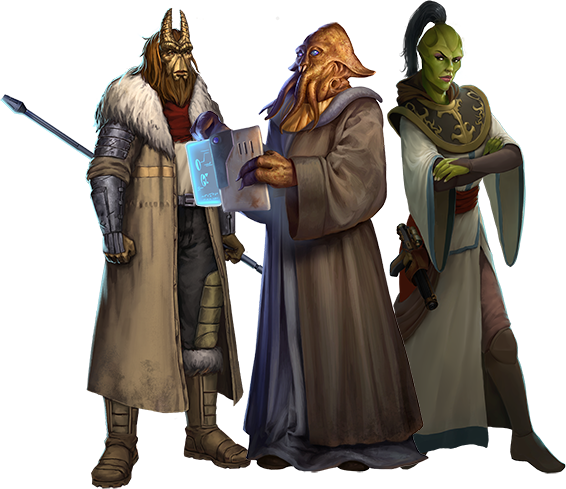 Hailing from the same world and often feuding with the Mon Calamari, an ill-tempered Quarren would make one intimidating smuggler. They start with a rank in negotiation, can breathe underwater (of course), and can spit ink once per encounter within short range. The Gotal are goat-like guys with horns that are sensitive to energy.They start with a rank in perception, and once per encounter can sense the current emotional states of living this within short range. Fallen start with a rank in charm, and can emit pheromones and change their skin color. Mechanically this allows them once per encounter to upgrade a charm, deception or negotiation check with a living creature within short range. Not bad! Any of these have fantastic possibilities as smugglers or any of the many paths available in Edge. The new specializations are Charmer (Lando archetype), Gambler, and Gunslinger. All smugglers start with Coordination, Deception, Knowledge (underworld), Perception, Piloting (Space), Skulduggery, Streetwise, and Vigilance as career skills. Charmer adds Charm (well, yeah), Cool, Leadership, and Negotiation. This would be an excellent face of the party, with a few shady skills like knowledge underworld, streetwise, and skulduggery just to keep it interesting. Most of the tree involves modifying Charm and Leadership checks with such titles as Disarming Smile, Congenial, and Works Like a Charm which actually allows you to use Presence rather than another characteristic associated with a skill, once a session. Another cool one is Just Kidding! which allows you to spend a destiny point to ignore a despair generated on a social check within short range. Gambler adds Computers, Cool, Deception, and another Skulduggery, allowing you to tip the odds in your favor. The shape of this tree is pretty unique, and is probably one of the more expensive paths to get to dedication. Cool talents include Fortune Favors the Bold: suffer two strain to flip a dark side destiny point to light side once a session. Another interesting talent is Double or Nothing: 2 strain to increase the difficulty of the next check by one, if successful double the remaining advantage, once per encounter. The improved version has the same effect for successes, and the supreme version does the same for triumphs and despairs. Gunslinger is the most combat-oriented path. It adds Coercion, Cool, Knowledge (outer rim), and Ranged (light). Most of the talents are old favorites like quick draw, lethal blows, and grit. Guns Blazing allows you to avoid increasing the difficulty for a ranged attack with two weapons for two strain. Another talent which wins for best name is Sorry About the Mess: decreases crit rating of a weapon by 1 (minimum 1) against targets that have not acted yet in the encounter. The second section has a host of new gear, including some big mean pistols for gunslingers, as well as an ion droid disabler, knockout grenades, and a CryoBan projector that can freeze your enemies, or put out ship fires. Armor includes a smugglers trenchcoat allowing checks to find things in the coat by searchers to be opposed by the skulduggery of the wearer, and a Mimetic suit which, while rare, works as a personal cloaking device, upgrading stealth checks twice. There are also new cybernetics, and other shady gear like lockpicking tools, fingerprint masques, and false credentials. Weapon upgrades include paired weapons which reduce the advantage required to hit while dual-wielding by one, and set trigger (hair trigger) that adds a success and threat automatically for the first combat check in an encounter. New vehicle stats include a couple of airspeeders, and landspeeders, but the starships section adds some awesome new entries. One of my favorite enemies in the old X-wing PC game was the Assault Gunboat, also known as the Star Wing. It includes stats for that, as well as a recent X-wing miniatures game model, the VT-49 Decimator. I can’t wait to send in a Decimator flanked with interceptors against a party. 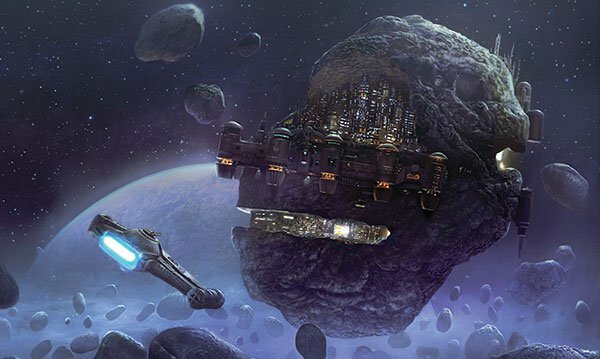 Appropriately, there are a few light freighters and yachts for the successful gambler, as well as stats for the Gozanti-class armed transport seen in the Star Wars Rebels show. Disappointingly, it doesn’t mention the variant that allows for TIEs to dock and launch from it like we saw in the show. Last but certainly not least are stats for the HWK-1000 light freighter, which looks much like the HWK-290 but has a few performance upgrades. Capital ship stats include the Interdictor-class heavy cruiser, and a silhouette 8 space defense platform. 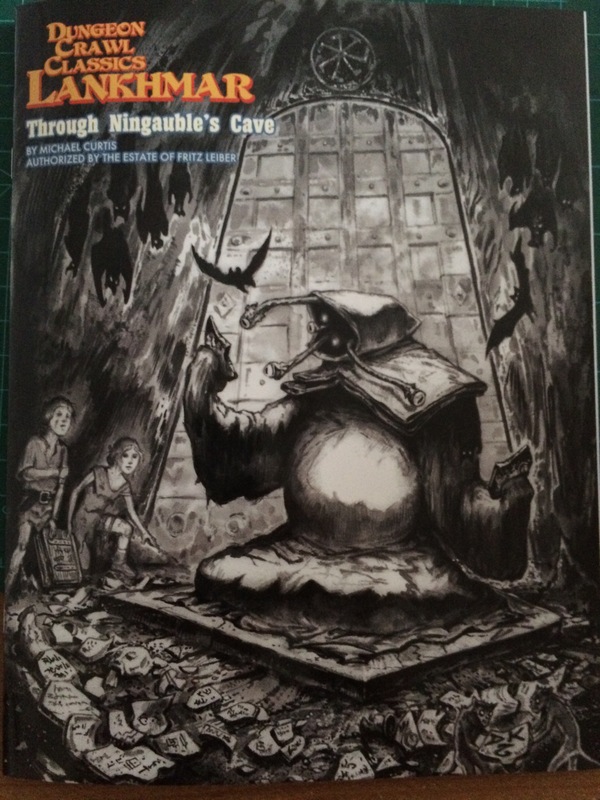 The third section is mainly geared towards the GM and includes ideas on how to incorporate smugglers into a group, as well as adventure seeds and smuggling jobs, cons, and scams. There are also expanded rules and ideas for astrogation checks, heists and break-ins, and showdown and shootouts. Pretty much everything that makes Edge of the Empire an awesome part of the Star Wars universe to play in. The art remains fantastic and inspiring. If you’ve sat out of the last few sourcebooks waiting for one that really exemplified what Edge was all about, this is it! Reaper Miniatures has just about finished releasing the second of it’s $3 Million dollar Kickstarters for the Bones line of plastic miniatures. Between these two Kickstarters, both of which I supported heavily, I’ve got probably a lifetime of painting before me, and most of my miniature needs addressed. That said, not all Bones are created equal, and if you’ve gone through your figures, you’ve probably seen some that didn’t make it through the shipping process that well. So, here are some tips to get your Bones reset and back into shape before you set to painting. 1) Due to being packed in with a few hundred other guys, not to mention the imperfect nature of the universe, some of them are going to get bent, twisted, and generally frog-legged. This can be remedied, and should be addressed before you put any paint on them. 2) A lubricant used in removing them from the injection molding causes them to naturally resist water (and water based paint) so you’re going to need to scrub them or prime them, or both. 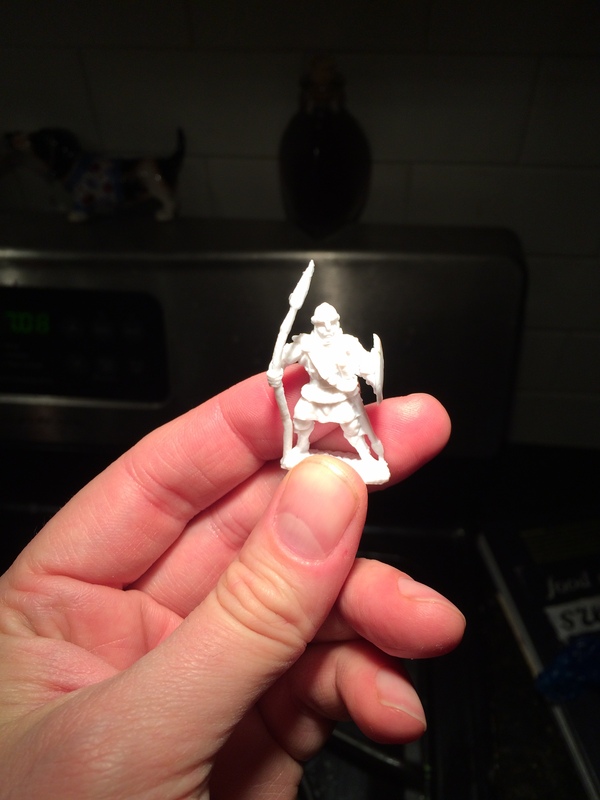 3) Just like metal miniatures, you’re going to have some oddities, including seams and sprue bits that you’re going to need to trim or shape. We’ll get into that as well. That spear doesn’t look like it’s going to be impailing anyone any time soon, but a little boiling water, and it’ll be right as rain. 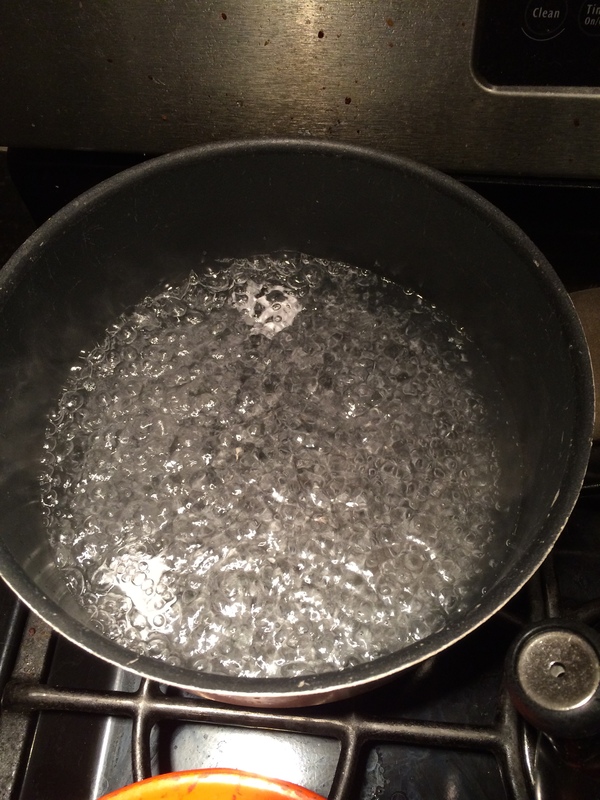 Bring your water to a rolling boil in the pot. You’ll need enough water for the largest figure you want to reshape to be fully submerged. the worse for wear, but I’m sure too long will have them ending up as goo, so be mindful. Using the tongs, remove the figure, careful not to burn yourself or mke unwanted impressions on the figure itself. I used running water but a bowl of cold water would work too. The figure will be noticeably more malleable than when first submerged. Typically, a figure placed at rest will return to it’s original intended shape. Sometimes, it may need a little help, however. I found my figures to become cool enough to touch after only a few seconds in the open air, however be careful and use your own judgment. You can use the tongs or two sets of tongs to manipulate the figure into your cold water, but as I said, I found it no problem to do it by hand. Be sure to have the figure completely in the desired position before placing it under the water, because it’s going to hold its shape whenever it cools. Remove from the water and voila! The spear looks a lot more deadly! This can be taken a step farther. 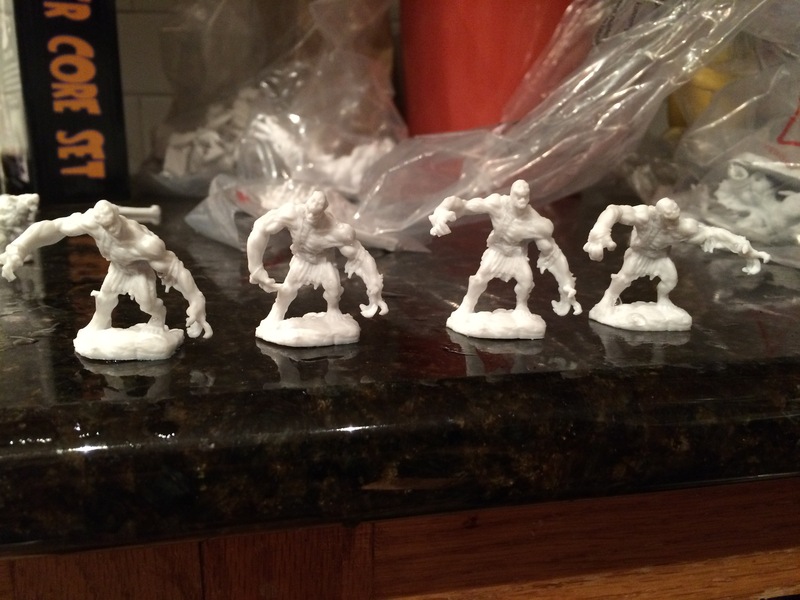 I found some very repetitive ghouls in my set that looked a litle silly, and all had the same very unnatural pose. So, snipping some flashing holding the figure’s arm to his leg, I decided to see how much flexibility I could get out of a few bones figures, hoping to make each one look a bit more unique. 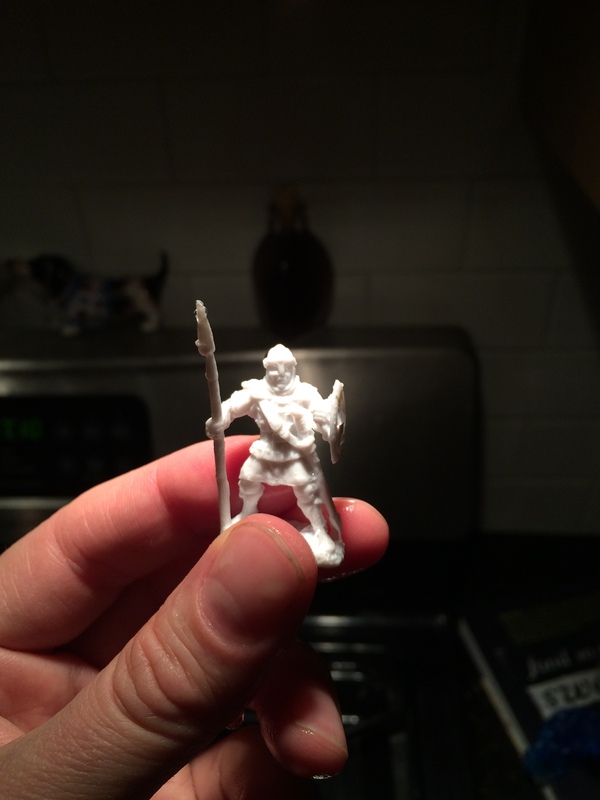 Now that you’ve shaped your miniature, if you haven’t boiled the figures, you’ll want to give them a scrub. 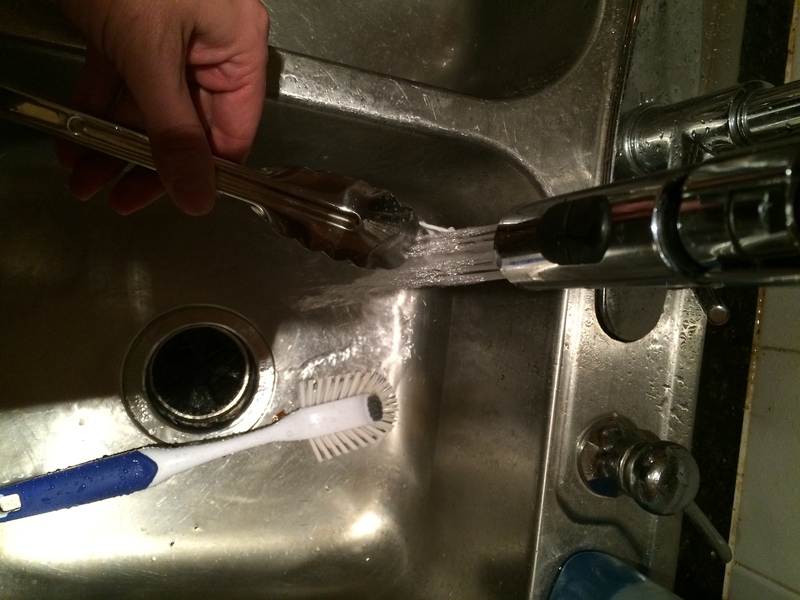 Dish soap and an old toothbrush should do the trick. Note that submerging your reshaped Bones into hot water might cause them to revert to their original shape, but your boiling should have removed the chemicals anyway, so scrubbing is mostly for unshaped miniatures. While Bones are ostensibly able to be painted without priming, I have never found them to be very receptive to paint without some sort of primer. 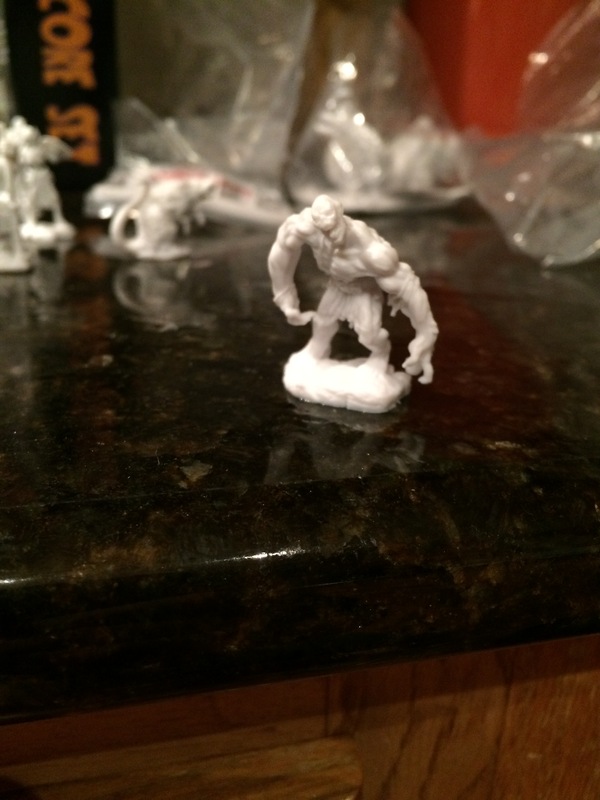 Experiment with a few less favored figures to see how your preferred primer works on them. I found some spray primers to make figures a little more tacky than others, and who knows what chemical compounds might interact between plastic and aerosol spray. Use caution before you spray prime your favorite figure. will help to put them in better shape. Trim off any excess flashing, then gently file any seams or surplus rubber until it matches the surrounding textured surface. For gluing remaining parts together, you’ll need to be careful using some form of superglue or zap-a-gap. You can use CA+ or regular superglue, but both will stick to your fingers together (painfully) if you’re not careful. Good luck enjoying your new Bones! Let us know if you’ve discovered any other tricks, or shoot us some screen shots or links of your Bones masterpieces!